Opinion: Maj. Gen. Elewu shouldn’t be interviewed as he deserves ‘to be put on trial’! “A poor person is very dangerous. He can do anything to survive. We need to support projects such as Operation Wealth Creation and others that focus on the socio-economic development of this country,” Uganda People’s Defence Forces (UPDF) Commander of Land Forces, Maj Gen Peter Elwelu (Daily Monitor 17.04.2017). Let me be clear, when Brig. Peter Elwelu was a bit unknown his voice and opinion might have mattered to me, as then he would just be another fellow human being with an understanding of the world. But people like him, now after the crime, I cannot let him discuss state and government matters and not talk about what overshadows for me. Brig. Elwelu or Maj. Gen. Elwelu now, is for me until proven innocent, a man who was in-charge of unlawful attacks on the Royal Palace in Kasese and the massacre of unknown amount of guards, police officers, civilians and others. So while the Obusinga bwa Rwenzururu Charles Wesley Mumbere is in house-arrest in Baganda. The army commander in charge of the operation, the one that killed innocent and burned the palace without any forewarning is looming the streets. That the army man who was in-charge has since than been promoted, while the families of Kasese does not know the consequence and the reason for their death. Other than the salaries and that the state sanctioned the army to do this at one point. That the Kasese attacks and tragedy escalated quick is easy to understand, that it became is evident and that the army had to hide their crimes with even burning. Letting the dead decompose while the “evidence” of it all was collected. Since the knowledge of who ordered it and who wanted it come from up-high. That Brig. Elwelu just followed orders might be true, still he completed and directed the mission, with bravado as the dead was dug into mass graves while the priests we’re praying for the lost souls. They should have also prayed for the soldiers who killed innocent men and woman on the compound in Kasese. That Brig. Elwelu made happen with his ordered and persistent attitude during these days of violence. That Brig. Elwelu believes poor people can be dangerous is true, but his voice on the matter. Shouldn’t he important. As he has poor record of caring about how people has it and how people live. He had no issues with burning and killing in Kasese, he could do the same in Teso, Tooro and Busoga, why not? I do not trust this man and I can surely not be alone. His voice shouldn’t have space in the Daily Monitor, as Brig. Elwelu suddenly deserves to be in the public sphere. Lets be clear he don’t! Not until he has answered and maybe cleared his name for his possible, and most likely crimes against humanity in Kasese in 2016! Peace. Opinion: Why hasn’t there been any real investigation into the #KaseseAttacks? There has now gone months since the Uganda People’s Defence Force, Special Forces Command and the Police Force on the 27th November 2016 has skirmishes inside the Buhikira Royal Palace in Kasese. This we’re done again as the authorities have done in the past in Rwenzori and Rwenzori sub-region, as they have made the Rwenzururu Kingdom and their Ombusinga Bwa Rwenzururu Charles Wesley Mumbere a guerrilla leader for a unknown militia called the ‘stronghearted’ or the Kirumiramutima. If these allegation we’re true and the government had real investigation to all the acclaimed issues since 2014, than they would have charged someone before blasting and killing so many Royal Guards in November 2016. The whole last skirmish was dim of justice and real security operation as the Brigadier Peter Elewu and Maj. Gen. Muhoozi Kainerugaba cavalry ran into the compound and did their disgraceful acts of vile violence and human rights violations. They killed and burned down the palace, they put graves with no names days after and wouldn’t let the families see the deceased, and they left behind trials of misconduct. Such, acts of killings that the world only see’s in time of war or even a civil-war. The state organizations and their security organizations are secretly about their acts. If the State had been serious they hadn’t made the ones who were the targets of the gunfire and the burning the ones lingering in jail in and around Jinja. The same happen to the remaining royal guards also detained there. There wasn’t much grace or glory, as the king was at one point out for under an hour time before getting back inside prison. On the second time now he is exile in Kampala as the government doesn’t let him out of control and travel to his kingdom. While this has happen the M23 has crossed from Ugandan territory to the Democratic Republic of Congo, as they have left the barracks and they have even been caught few of them in the Kasese District and Mbarara Region. There are prospects that could easily fix into a conspiracy as the insurgency and attacks on Rwenzururu Kingdom could be seen as shadow game for the release of the M23. So, with the rumours that haven’t been verified as well, was French speaking army men at the Buhikira Royal Palace in Kasese. What are more worrying are the open questions, as of the verified numbers of dead between the army and police force. That was in the days after skirmishes. They we’re really not making sense as the amounts of dead after it all. With the loss of lives to all the royal guards, unknown civilians, police officers and so on. The State Figures still doesn’t make sense with the reports and spokespersons release in the army and police in the early days after. The need for an investigation is clearly there, the army, police force and security organizations who acted vile in Kasese. The Rwenzururu Kingdom have been violated, the Rwenzori and Rwenzori Sub-Region has been used as a boxing bag by the NRM government. No visits from the President, the mediators or even the IGP Kale Kayihura have stopped it. As the army intervention have still let the government killings continue, as the post-election violence was created from the Special Force Command, maybe M23 and other operatives in the UPDF. That can be said, as their no clear investigation or intelligence that can be truthful, as the government tries to silence the truth. Their cherry of innocence is long good. If the NRM government really cared about their victims they wouldn’t defend the culprits, but the victims, the unknown and the unnamed dead who was assaulted and lost their life to early, as so many of the Royal Guards has done during the last year in the Rwenzururu kingdom. Peace. Kasese Clashes seems like a total cover-up and the numbers doesn’t add-up! There are something that doesn’t seem right today, as there are reported that that over 50 people who has been unidentified by the locals in Kasese being buried together. As they are all lifted of the Police Wagon and buried in the ground. “Burial of 52 unidentified bodies at Rukoki UPDF army barracks in Kasese; religious leaders lead prayers” (NBS TV Uganda, 04.12.2016). There is with sadness that so many people are buried, not by their own families and not by their folks as these are remains of their bodies and souls have lost even the humanity of grief as the Police Commanders and Priest are praying over their fall. Imagine if this was your brother who in a little moment we’re they dug a unknown grave to at an Army Barracks, by people associated with the ones who might killed him. That isn’t respectful, but shows the extent of how the Republic violated the trust between themselves and the society at large. The Uganda People’s Defence Force with French speaking soldiers, most likely M23 cadres who has gotten free-pass after the surrounding of Goma and the amnesty from the government of Uganda in 2013. So the red-hats we’re around the compound and inside the palace on the days of questions, as the leaked clips from Police Officers has showed military men speaking French, which a token of the M23 connection to the authorities that happen at Buhakira Royal Palace in Kasese. With that in mind it we’re reported the army, but they are now collectively with the Major General Muhoozi Kainerugaba of the Special Force Command, which we’re in charge directly we’re Brigadier Peter Elewu who always will have has hands tainted of the affair. This as Minister of Interior Jeje Odongo blamed the Royal Guards for the sieged palace attacks. While the leaked clips in the recent 48 hours shows the gates opened up in peace when the soldiers arrive before the attacks transpired. With the knowledge of over 52 unknown buried today, with reported also that families we’re able to identify at the mortgages in Kasese about 70 bodies. There has been alone in these calculations over a 120 royal guards killed plus the 130 who we’re detained after it all. As well as 15 kids who we’re in and around the area who has not been accounted for and still has surfaced. This with the knowledge of the 14 police officers who lost their lives and the royal guards we’re official numbers 48 Royal Guards. That doesn’t add up in any math-class. If there we’re only as AIG Andrew Felix Kaweesi claimes still that the official number 62 total dead after the Kasese Clashes, than who are the 52 unknown buried from? Did they just drop dead and arrived on a yellow bus up the hill from a Safe-House around Kampala? Where did they come from; as well as the reported 70 identified Royal Guards that has gotten buried by families and friends. Not been buried on a UPDF Barracks grounds; which is the killers donating dirt to the ones who suffered their demise. So the Police Force and the government tries to dummy it down, tries to deduct their numbers and make the people into submission with wrongful statements, as there aren’t even conducted proper statements for the ones in the fires and killings in the rest of Kasese District the same week, as the army attacked other places, which mattered to the Kingdom and where they had royal guards. So the numbers of now is more likely to rise again, when the cover-ups are shed lights on as the people talks and the circulated information are coming. But 70 identified, 52 unidentified, 14 Police Officers and plus the unaccounted for is more than 62 by calculation. So the lies are very evident and clear. The Government tries to overshadow the reality and their own shoddy behaviour where they went to burn down a Royal Palace and get rid of a Kingdom. This happens without any for-warning for civilians or anybody else. The worry is how easily this information get pushed around without questions; that the newly buried men are not counted in as it is close to artificial number the Police has offered as fact. That isn’t a mere opinion, but fact from their official spokesperson who lies more deeply without any flinch of the eye-lid compared to his comrade Fred Enaga. AIGP Kaweesi lies so much, that truths are myths to fellow human being and his existence. All the leaked material shows the disrespectful attack the Police together with the Army and M23 had on the Palace, as well as the Kenyan leaked clips where the Army even buried men alive on the compound. Which I am sure has not been accounted for and the ones that we’re taken by the fire, if there we’re any are surely as well not accounted for. There are so many lives that don’t matter to the authorities and the families are left in the dark. The Republic is left in the dark when these matters are unsolicited for and are acted upon in this way. The reality is that too many lived died on that weekend and week in question in November 2016. The reality is that the men behind are saved behind shields of comfort by the ruling regime who don’t have capacity to see their evil intents and acts upon their own. The reasoning behind this attack on humanity is still in the wind as the fellow response from the world other than a U.S. Travel Advisory has been a true evidence that the deaths doesn’t matter to them either; which in itself is worrying sign of how much evil a regime can do without consequence from their fellow allies and trading-partners. This kind of acts should make the donors start stuttering for their affiliation with this regime. Parts of me wish this was a gay-club shootout in Kampala, than the rainbow nations would show some concern and condemn it, but since these men and woman we’re connected to a Monarchy in the Mountains of Rwenzori, than it wasn’t to worry about; which is disgraceful from anyone who values lives over monies. We can all question the behaviour and condemn the attack on the Royal Palace, the days after and the aftermath we’re all cronies has tried to certify the Obusinga bwa Rwenzurururu Charles Wesley Mumbere as a “terrorist” and having a terrorist group, with a pistol given by IGP Kayihura, an AK-47 and a bunch of machetes. While the army came in with sophisticated weaponry and rifles, used bombs and burned the palace down to total utter destruction of the Palace. As they acted more like terrorist, as the Royal Guards as by leaked films greeted and welcomed the army inside. So the truth will overcome the nonsense. But what we can all take from this, the Ugandan Government doesn’t value the lives of their own citizens, as it could easily send in army get rid of royal guards, take king as prisoner and burns down his palace without warrant or warning. Seal of the town of Kasese and evacuate all people and detain a journalist for filming matters. So the matter of consistent disregard for the people Kasese has been from the get-go. The motives and the reasons behind the attacks, can be many or a few… it can be the creations of districts, can be clearing way for the planned military compounds in the district as there been speculated that Museveni wants to re-enter into DRC and the mineral rich areas across the boarders! But that is all speculation at this point. We cannot know at this point. We cannot see the reason or added reality for the massive attack on humanity that happen at Kasese. We cannot adjust or amend the reality for the ones that already we’re taken for granted and killed by a gang of merciless government security agents. This is mere fact, but the reason behind the killings, burnings and destruction of a monarchy is still unknown. When the truth will surface is unknown as the many victims of the clashes in Kasese. The truth might be smeared and beholden to few powerful men, but all the dead deserve more than what they getting. These men and woman, these people who lost their own in mere hours that weekend needs answers, need recognition and needs the truth. While the government might need it deeply sealed, because they went all-in without concern of life or justice. They sent their mercenaries and killed their own. We can all see that because of the staggering numbers of dead that appeared after it all; what is worse they might be wrong and not bring justice to the total dead. Which proves how much loss of life happened and why the people of Kasese deserves something else than the spin-control of the authorities that we’re in-charge of violence that day. LONDON, United Kingdom, February 29, 2016. The Ugandan government is continuing to violate the human rights of leaders of the opposition Forum for Democratic Change (FDC) and undermining the ability of their party to legally challenge the results of the 18 February elections, said Amnesty International in a statement, as the 10-day deadline for filing presidential election petitions looms. Security forces have repeatedly arrested the aggrieved presidential candidate Dr Kizza Besigye, and some of his party leadership colleagues and supporters. They have also besieged his home, and raided the party’s main office in the capital Kampala. “The FDC has a legal right to challenge the election results and it must be allowed to do so,” said Sarah Jackson, Amnesty International’s Deputy Director for East Africa, the Horn and the Great Lakes. Since the results were announced, Dr Besigye has been detained without charge at police stations or at his home in Kasangati, near Kampala. His first post-election arrest was on 22 February, as he attempted to leave his home the day after he had suggested in a televised speech that he would challenge the outcome of the election in the Supreme Court. “These arbitrary arrests are an affront to Dr Besigye’s right to freedom of movement and a clear sign of the prevailing climate of impunity and disregard for rule of law in Uganda,” said Sarah Jackson. “The Ugandan government must fully and effectively respect its own constitution, and honour its voluntary international obligations to protect every Ugandan’s human rights, including to freedom of movement, freedom of expression, and freedom of peaceful assembly”. On 20 February, the Electoral Commission declared incumbent President Yoweri Museveni winner of the presidential election with 60.75% of the vote as opposed to Besigye’s 35.37%, an outcome Dr Besigye dismissed as fraudulent. The election took place amidst a government-ordered social media shutdown that according to European Union (EU) election observers “unreasonably constrained freedom of expression and access to information”. According to the police, Dr Besigye’s continued arrest was made under powers of “preventive arrest” for “utterances and activities that amount to incitement to violence and defiance of the law”. Amnesty International has examined Dr Besigye’s televised remarks and does not consider him to have incited violence. FDC headquarters were raided by police on 19 February, while elections were ongoing in parts of Kampala. Witnesses interviewed by Amnesty International said police officers fired tear gas canisters at crowds gathered at the scene. It’s been a day with heavy deployment in Burkina Faso. The recent activities are still under way and the reports from the ground and they will continue to come. The Coup d’etat which is happening as we speak is strange especially thinking about the recent process that the nation has been under in recent months. That the military has all of a sudden carried out! The releases that are released are from certain big organization, multilateral organization and bigger nations that have a say in the world. Régiment de sécurité présidentielle (RSP), as well as today’s announcement of the appointment of “new authorities” (…)”She welcomes the unanimous condemnation by the international community of these acts, which constitute a serious threat to peace, stability and security in Burkina Faso, the region and the rest of the continent. She calls on all the AU Member States and the international community as a whole to ensure that this attempt to undermine the Transition is defeated. The AU considers the announcement by the military of the “dismissal” of President Michel Kafando and the attempt of substituting him with “new authorities” as null and void” (…)”The Chairperson of the Commission reiterates the imperative for the defense and security forces to operate under the control of the political authorities. She stresses that the repeated destabilization attempts by elements of the RSP since the beginning of the Transition highlight the need for security sector reform in Burkina Faso, as part of the efforts to deepen democracy and strengthen the rule of law in this country” (African Union, 2015). 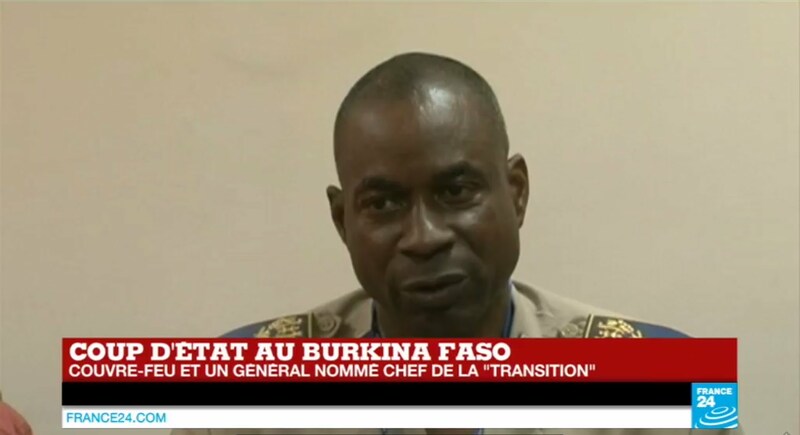 “The situation in Burkina Faso is deeply worrying. The interim president and all those detained must be immediately freed and their physical integrity protected,” said Gaetan Mootoo, Amnesty International’s West Africa Researcher” (…)“The security forces must respect the right of the population to protest peacefully, and take action to avoid any more deaths or injuries,” (…)”The coup d’état comes just two days after the National Reconciliation and Reforms Commission recommended that the RSP be disbanded following accusations that its guards opened fire on unarmed protesters during last year’s anti-government protests” (Amnesty, 2015). “The Presidential Guard’s decision to detain key members of the transitional government weeks before the election is a direct threat to Burkina Faso’s transitional process,” said Vukasin Petrovic, director of Africa programs. “It is imperative these officials be released and citizens of Burkina Faso be given the opportunity to peacefully vote for their new government” (Freedom House, 2015). “South Africa strongly condemns any attempt to seize power through extra-constitutional means or the resolution of political disagreements through the use of force. This incident is a serious violation of Burkina Faso’s Constitution and the country’s Transitional Charter. South Africa calls for the immediate release of Interim President Kafando, Prime Minister Zida and other leaders, and appeals to the people and all political leaders in the country to refrain from any violent activities that may further undermine peace, security and stability in the country. We urge all involved, including Burkina Faso’s security forces, to adhere to non-violence, and to debate issues in a peaceful and inclusive manner” (RSA, 2015). “The United Nations stands firmly behind the transitional authorities and President Kafando. The Secretary-General notes the strong support of the people of Burkina Faso for a peaceful transition and urges compliance with the transitional calendar, including the upcoming elections.”(United Nation, 2015). “The United States strongly condemns any attempt to seize power through extra-constitutional means or resolve internal political disagreements using force” (Kirby, 2015). “today confirms that operations at its Mana Mine in Burkina Faso have not been interrupted by the coup d’état that erupted yesterday in the Ouagadougou area” (…)”The Mana Mine is located 270 kilometers southwest and a five-hour road trip from the capital of Ouagadougou. We are closely monitoring the situation with our partners to ensure the continued safety and security of SEMAFO employees” (La Valliere, 2015). Hope this was some insights and hope when it has transgressed over the recent day. I have nearly ever read that governments and human rights organizations have been positive to a coup d’etat in any country. So that they are telling and condemning of the actions of the military should been seen as reasonable in any sense. The process of the matter and the reactions is normal. I and other just pray that this lead to security and safety for the public. The Burkinabe should get political and economic freedoms that they deserve, because there to many coup d’etat’s in the country. If they get this by yet another coup d’etat we cannot be sure of. That this will generate wealth or generate any kind of stabile government is not certain. Especially when they jail the ones that we’re leading the transitional government that was in place for the moment and time. And the outcome of this will lead to outrage and issues between the public and the new military government. The issues between the Burkina Faso and the outside world will also be in jeopardy and the legitimacy of the government would be hard task. Reasons for the coup and knowledge will be dropped later and the stories behind will surface. For now we will hope and pray that this will lead to something good. Though it’s hard to know since the ones grabbing guns and taking it by force isn’t often a way to a healthy democracy or peoples republics. The last one who stepped aside and made a difference this way was Ghana’s Jerry Rawlings. But he is a rarity in this world. Peace.